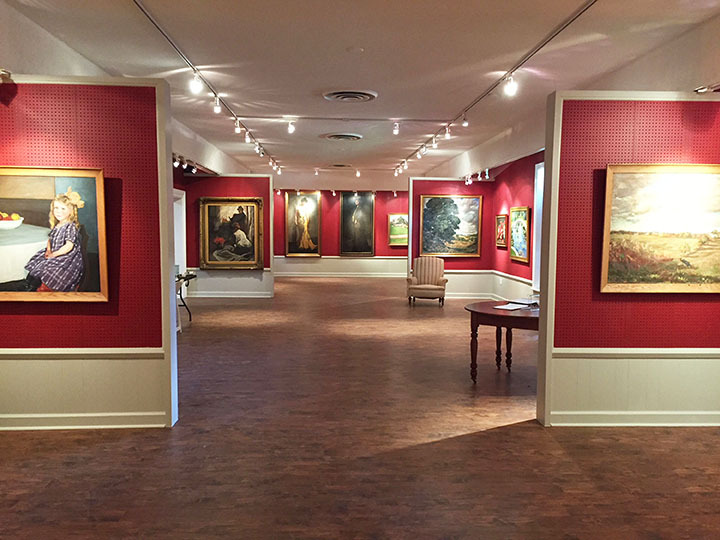 The Kate Freeman Clark Art Gallery is a special place for hosting a wide variety of social events. The colorful paintings of landscapes, portraits and still life provide an elegant background for a cheerful and hospitable ambiance. As an event venue popular for wedding receptions, rehearsal dinners, family reunions, civic club meetings, fund-raisers, birthday parties, luncheons and dinners, the Gallery is equipped to provide full hospitality service. The Gallery accommodates up to 90 place settings using 13 round tables and four eight-foot rectangular tables. Services can be tailored to the scale of the event. A new special feature of accomodation, an outdoor brick patio was created during a recent renovation. The patio can seat 109 guests at round tables. To make sure the weather does not affect the event, a tent over the patio is recommended. The patio can also serve as an overflow area where guests can socialize while the Gallery is setup for a seated dinner. The Gallery can provide full place settings for luncheons or dinners complete with water goblets, wine glasses, plates, silver ware, table linens, napkins and serving dishes. Event organizers may provide food service through their own caterer. Servers will find that the fully-equipped caterer's kitchen and plating tables make the process work smoothly without disturbing guests. Call the Gallery office at 662-252-5300 or email walter@katefreemanclark.org for more information on fees, services and availability.